As you become older your risk of falling increases significantly which is why it is so important to make sure that we eliminate all risk factors which may predispose you to falls. Did you know that in people aged 65 years and older falls are the biggest reason for hospitalisation? Falls can greatly impact one’s ability to remain independent. 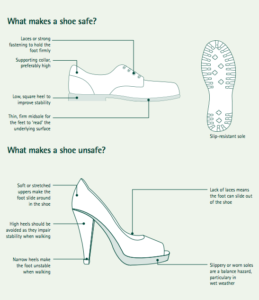 One known factor that can increase your risk of falls includes footwear. If you are at an increased risk of falling or have previously experienced falls it is important to seek assistance from one of our friendly podiatrists to assist in reducing your risk factors of falls for the future.